The project is about optimizing http://cloud.scilab.in/ to reduce total response time experienced by users after hitting execute button. In existing implementation, a scilab instance is created for each user request which loads all scilab libraries in the background while executing the script from the website. 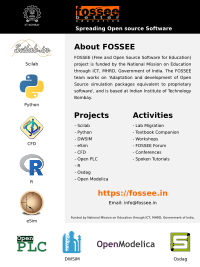 Are you new to the Free and Open Source Software (FOSS)? Do you want a better understanding of the concepts in your subject? Are you someone who prefers a practical approach over conventional methods for learning? Would you like to learn to use new Software tools to increase your employment potential? Well, we present you - The Textbook Companion or just the TBC, a perfect tool to assist you. Osdag is a cross-platform free and open source software for the design (and detailing) of steel structures, following the Indian Standard IS 800:2007. It allows the user to design steel connections, members and systems using an interactive graphical user interface. The interactive GUI provides a 3D visualisation of the designed component and creates images for construction/fabrication drawings. The design is typically optimised following industry best practices. A beta version of Osdag was released on 21-Jun-2017.